This is my second, and preferred, reading of my poem, Ink Ocean. The poem began to arise in two drawings, one of which I have included in the album cover, and the writing from the other drawing (which I took a photograph of before covering it in ink and paint). 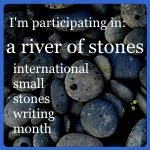 "Your challenge, should you choose to accept it, is to write a small stone every day during the month of January. What is a small stone? A small stone is a polished moment of paying proper attention." arrayed black musical notes on the rhythms of wind in bare trees. speeding without collision through the wind-waving branches. How would I describe Keith Jarrett's music as he plays his piano in these concerts? A beauty of muted passion, rather than dramatic and sublime in a Kantian sense - what's bursting in Jarret held in minimalist reign. Harmony that is off balance. Discordant harmony. What we hear is not so much the struggle of a man to come into being, but a man making love to the muse who sings through his instrument. We witness effort, yes, in a delerium that encompasses us. Trills and moments when the music misses a rail, backs up and continues on. Within a constancy of notes that don't go anywhere, become anything, that are unrelenting throughout. Where the echo of the note is dampened. He knows the terrain, but he's never visited this musical spot before. He learns as he plays. As he plays, he intuits the next notes. Impromptu within a form.